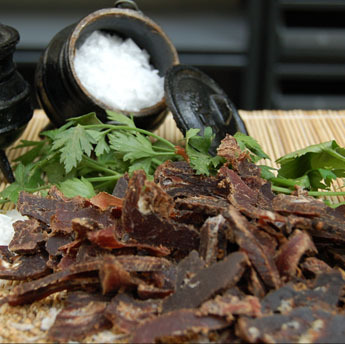 Thin Slices of Exotic Game Biltong gently marinated in a mixture of coriander, rock salt and crushed black pepper. 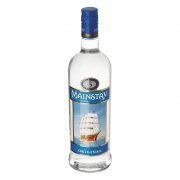 The ultimate South African taste experience. 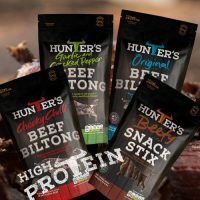 Choose from Red Deer, Buffalo, Ostrich and Kangaroo. 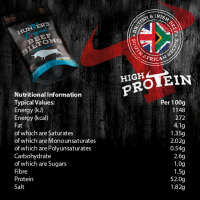 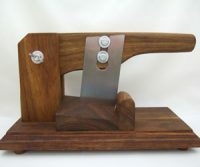 Nothing quite beats the flavour of game Biltong, its leaner taster and much healthier due to the low percentage of fat. 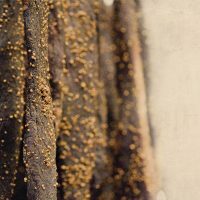 We only use our own Original spice recipe in the production of all our Exotic game Biltong. 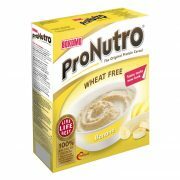 These spices that are Gluten and MSG Free / Free from artificial colours and flavourings. 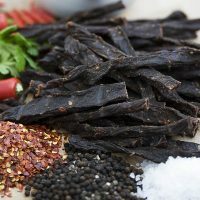 Biltong as natural as it should be. 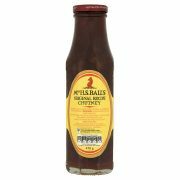 Spice Ingredients: Seasoning Mix – Salt, Spices (Coriander, Black Pepper) Caster Sugar, Flavouring (contains yeast extract, salt, maltodextrin, caramelised sugar, sunflower oil, flavourings (natural flavourings)), cider Vinegar , Preservative: Potassium Sorbate. 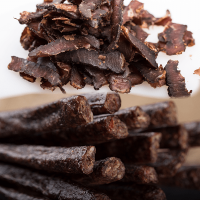 Tasty Biltong Sticks Vacuum sealed or in a perforated bag. 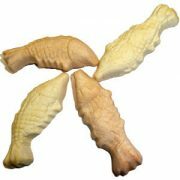 Simply choose your flavour, weight, how you liked it sliced, dryness, fatty or lean and how you liked it packed. 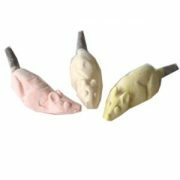 Chilli Bites and Original Snap Sticks. 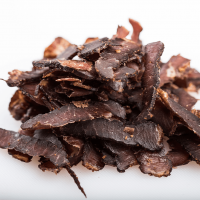 Pencil thin slices of Seasoned Biltong.